Adding Gzip Compression to .Net Core – Microsoft Azure Articles.. In this article I would like to Explore the usage of GZip compression in the Server-side for a .Net Core web application. I am sending a JSON object list consisting of 1 Thousand items. In the ordinary response format it is taking 1 MB of file size and 1 Second to receive in the client-side. I am using an Azure S2 Service for deployment & testing. Following is the Chrome display of the URL Statistics. 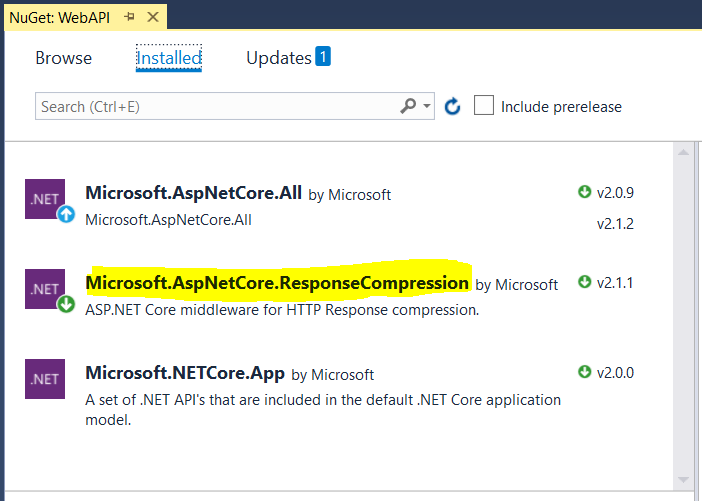 Now we are trying to achieve the solution using ASP.NET Core Response Compression. For this we need to add the Library mentioned below to the application. In the Service.cs file add the following highlighted lines of code. Now compile, deploy & retest with the Chrome browser. You can see there is 90% reduction in size of the response! The response time also got reduce by 70%. The above code shows the components & code required to add JSON compression to your .Net Core application.